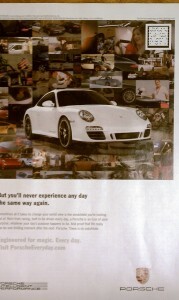 Porsche recently launched this print advertisement to promote its new Porsche Everyday campaign. 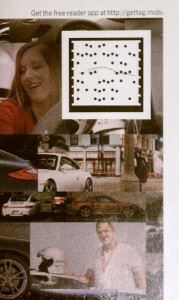 Featured in the ad is a designer Microsoft Tag. Before analyzing the scan resolve, let’s take a look at the creative. To begin, the company has chosen to develop and make use of a designer Tag. The standard Microsoft Tag makes use of triangle shapes, but dots such as the ones seen in the image below can be used as well. Beyond the dots, the Tag’s design gets a bit more customized with the placement of a car silhouette (see second image below), but I am at a loss to understand how this simple rendering serves to represent or portray the Porsche brand. Here’s the best practice test with respect to designer codes: If the code is viewed out of context can the consumer recognize the brand or product it is to be associated with? If not then there is little value associated with the designer code and, perhaps, there is no real need for it. The company chose to place the Tag in the photo montage and, while it is certainly large enough, I believe it gets somewhat lost with all of the other imagery. Personally (and I am not a creative director), I would have preferred to see the Tag in the bottom half of the ad where there was more white space. Also, by placing the Tag Reader app download instructions above the photo montage, I believe it gets disconnected from the Tag and may lead to a reader missing the information altogether. Regardless, the information is present, so points to the company for that. 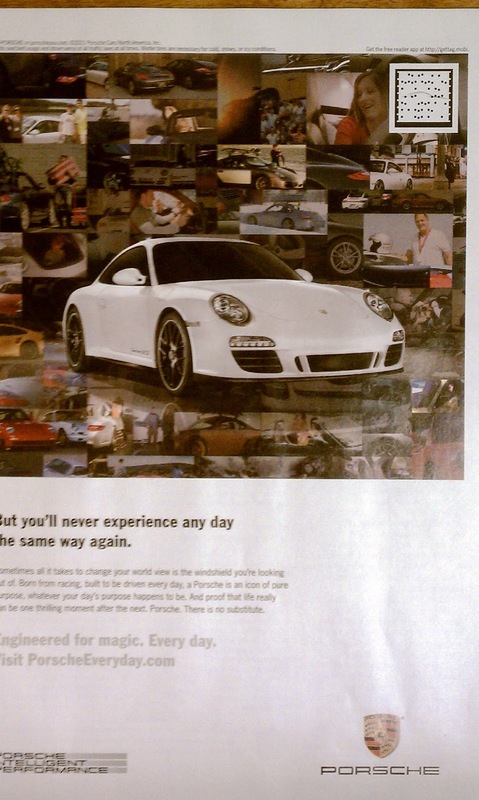 When the Tag is scanned, the reader of the ad is linked to a mobile website, which ties in directly with the Porsche Everyday campaign. The main idea behind the campaign is that real life Porsche car owner stories are used to fuel the conversation and interaction. The reader of the ad can view stories by car type or by topic (e.g., comfort, safety, usability, etc. ), find a local dealer and sign up for news and updates. A note about some of the stories, some of them are linked to videos and some of the videos are slow to load and play, but overall they work. Also, for each story on the site, the reader of the ad has the ability to share the content. Above and beyond the use of 2D, which is done well, this is a great example of how best to make use of customer stories, reviews and accolades to inform others and help sell a company’s product(s).